Tenerife attractions include art shopping for sure. Tenerife attractions' art shopping is even found by Tenerife beaches. Purchase art from artists like Rubai Angelika Kellersmann. She produces Tenerife Art. 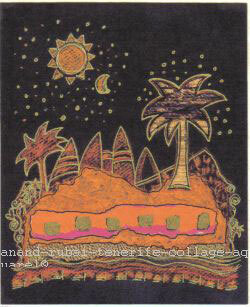 Buy her art such as this Tenerife collage. Layers with Tenerife bark and all kinds of other natural materials are used in her works. Unfortunately, the photo doesn't give credit to its unusual creation. Contact her at anand_rubai(at)gmx.net. The volcanic and warm Canary Island of Mount Teide is ideal to get energy and art inspirations. I know of six foreign painters in Tenerife who all swear that the island gives them not only more ideas but, also more energy and health to create more art as Tenerife attractions. 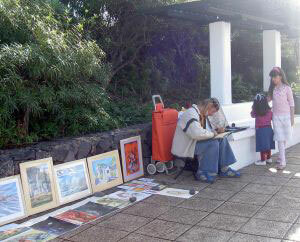 A street painter who is part of Tenerife attractions for art shopping. There is a Spanish lady, a neighbor of mine. I talk to her whenever I meet her in my street. This went on for several years. Only now, I know that her husband is Julio Puentes. 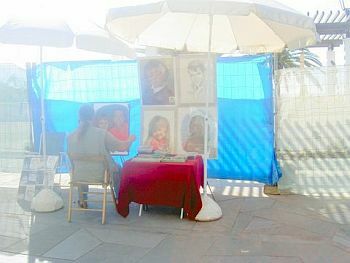 He is one of best portrait painters on the beach front by Lago Martianes in Puerto de la Cruz. Doing street art there, he must have attracted millions so far, Many of them stop to look. Some have a quick sketch done. Others order a portrait in oil which he does in his workshop at home. Of course, Don Julio isn't the only artist who paints on Avenida Colon by the famous Tenerife pools. Artists being Tenerife attractions whose addresses I know. 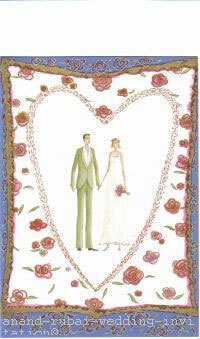 Wedding invitation card by Anand Rubai. More about Tenerife attractions by Tenerife artists. Collage artist and designer Puerto de la Cruz. Many a painting or collage by Rubai Angelika Kellersmann reflects a Tenerife topic, such as her work Teide Tenerife collage at the start of this article. Rubai Kellersmann who is also seeing her hobby as art therapy exhibits and sells her collages not only from home but, also in special restaurants such as Restaurante Las Palmeras Arte, occasionally. Small Tenerife artistic towns for art buying. The little west coast town San Juan de la Rambla is called a Tenerife artist town and so is Garachico which is also a town for art shopping, although less than before. Street painter at San Telmo Puerto de la Cruz Tenerife. Tenerife attractions Puerto de la Cruz cause art shopping. do caricatures or, landscapes, there. Tenerife attractions for buying music. Some Peruvians on San Telmo beach front, who are dressed the part, play Inca music with flutes in Puerto de la Cruz. They have relevant CDs with their music art work on a table to sell it. The Peruvian musicians in Puerto Cruz are an attractive and popular Tenerife attraction. Some African men sometimes offer wooden sculptures in the same spot. It could be art; it's hard to say how original those things are. They may even be machine made. Attend famous Tenerife attractions of folk music festivals... Try to buy the folk art CDs by their best musicians, who are called the Sabadeños... Some such CDs may be found in music shops on the biggest of all Canary islands. You stumble upon Tenerife attractions for art shopping in ports, in forests and by Mount Teide. The artists often prefer the Canary Island open air studio to an indoor atelier as an attraction for art selling. If you like what they produce, ask for their phone number... Art shopping is always welcome later, just as well. Art sale Santa Cruz before Christmas. Buy art from Canary Islands' youth in the Tenerife capital from Dec., 17th 2009 - Jan.,5th, 2010...Supermercado de arte (Supermarket of art) sells mainly smaller paintings from €50 - €300. Locate it downtown at Casa Elder, C/ Castello by Plaza de Candelaria... This art sale has made itself a name since 2003 by art awards received by some of the artists. Some time ago, I saw a young German guy at Playa Jardin on the beach park promenade next to the bistro for hungry beach combers. He was sitting on a bench drawing and painting water color landscapes of his surroundings. Hence, this painter looked so happy. up by the wall on the ground. They were only of DINA4 size, which made them fit into cheap protecting see through plastic covers. He sold each aquarel (water color painting) for €10 which is a give away. They were not prints, by the way. Please, mind, that he might only be one of Tenerife attractions for art shopping in winter. Summers in his native northern Europe serve him for selling his art work just as well. Sand art to buy in Tenerife? Then there's this other German Tenerife beach lover who makes astounding sculptures of black beach sand. His hat on the floor begs for a donation. I saw framed souvenir pictures with sand art at La Orotava's tourist shop opposite the famous Casa de los Balcones, some time ago. Tenerife attractions art selling need license. In April 2008 a beach artist was confronted by one of patrolling policemen of the Guardia Civil(not traffic police) on beach Playa Jardin. He said that a license was needed to sell there. He told the lady artist if he would find her again on this spot offering her works she would be fined €90. She pointed out to him, how happy passing tourists were when they saw her displays. He said that he also enjoyed her art works as attractions for the beach but, that the law was the law. She is expected to be back on Playa Jardin anyway disregarding the license threat because, she is seeing herself as one of Tenerife attractions for art shopping. Café attractions for art shopping. There are cafés, too, which offer exhibits in Tenerife. One such art café was in la Paz/'PuertoCruz'. It was too big, the rent too high. It closed. Artists which are Tenerife attractions themselves mingle at Café Bar Teatro. Attractive art at medical doctors' rooms. Even doctors have been part of Tenerife attractions for art shopping for quite a while. My friend Doris Chiandusi had named a few, before she died. I forgot their names. Doris was a graphic artist in Tenerife. Alberto Lombardo Italian Tenerife artist. One of the Italian painters in Tenerife, I once met, is exhibiting modern art permanently in a big Santa Cruz museum. Carlo Forte Tenerife South artist. Carlo Forte is an Italian painter. Book theme holidays on his finca (rural villa), where he teaches young and old. He sells his art there as well. Attractions for art shopping and Spain art prices Tenerife. All who do artwork or paintings in Tenerife will confirm that their art prices are much lower than in world cities which are known for the culture of art and which have a bigger market. The shop at Calzada de Cabras by the Piramides mall for affordable art has disappeared, unfortunately. However, Tenerife Spain is still interesting for real art insiders, for art collectors or, for art investors. Best known Tenerife art galleries for shopping art. Note that there is no more art gallery of paintings with sales at Finca del Arte which is now called Restaurante Mesón Chayofa. 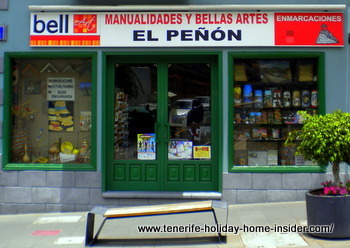 Art gallery which sells paintings and drawings of smaller sizes opposite the shop La Ranilla where often rather artistic crafts of Tenerife are found. Tenerife attractions to collect art by Spanish art auctions. Sorry, I have never heard of any art auction houses in Spain Tenerife. Art investments by Tenerife flea markets. Although flea Market de Nuestra Señora de África in Santa Cruz Tenerife is definitely one of Tenerife attractions for its sheer size alone, flea markets are not the best source for art shopping. You might be lucky with a framed old painting, though. You never know what you may find. But, you must be real early for that. Best before 9 am in Santa Cruz, Avda. José Manuel Guimera. Sundays open only... It closes by 2p.m. A reasonably good piece of art would disappear on the double. Try the Rastro Puerto de la Cruz, instead a better flea market in my mind. No contemporary good art producer will sell on flee markets. Shoppers there normally negotiate prices too much. As a last note, it remains to say that mostly paintings and drawings are offered in Tenerife art shops. Other artwork, such as sculptures are sold by the artists directly. Handy crafts are a different field, although, I saw rather exclusive crafts of good taste at the Puerto de la Cruz tourist shop Tienda Artenerife Artesania, C/Las Lonjas,n/s, Casa de la Aduana, Tel.922 378103. Art exhibition and sales of paintings by the Swallows group. This organization of painters of all sorts displays its works at a one week February venture by the seaside in the Swedish church of Los Cristianos. Find more information as well as opening hours under the topic Events of Tenerife. Tenerife Artists supplies, tools and accessories. Best Puerto de la Cruz art and craft tools supply. El Peñon is the only shop in North Tenerife where my daughter finds most of the latest tools and stuff for professional illustrations and any art work. She graduated at the Bournemouth college of art and knows the most modern tricks of the trade. Of course, similar art supply of material may be found near the University of San Cristóbal de la Laguna. However, we haven't discovered it yet. More basic supplies for art material at La Orotava. The best Tenerife handyman shop Le Roy Merlin Megashop La Orotava, which is opposite La Villa Alcampo sells you frames and/or frames for you at reasonable prices. Otherwise find best buys online at Fine Art America here. Tenerife exhibition center and workshop where art may be purchased. Orotava holiday to honor the Eucharist an artistic platform to trace fine art painters of the best. Not everything is part of Tenerife attractions art shopping. Much Tenerife art is only to be admired for free and is not for sale. It is temporary art, such as found by stone people art, sand art, Mueca art festival, Tenerife Carnival art and more. Artists of La Mueca 2014 may be encountered here. Christmas parties at Orotava mall with art shopping of paintings. Want any type of sculpture? Contact me if you want a Neo baroque or a modern sculpture... I know a very talented artist to do it who is also a painter. Need a place for art printing and lithography of the very best? There you may also get in touch with some of top art that's sold in Tenerife. Contact the Tenerife holiday home insider. There is hardly any insider informtion she doesn't have. This is very exclusive, as I can only provide more help after consulting with the source. From Tenerife artistic attractions to Puerto de la Cruz with its large art community and art shops.. Please, note that I am sorry, not to grant copy rights for this page as Anand Rubai, the artist, might not like to see her displayed art examples copied.